On the border of a massive hundred acre forest. 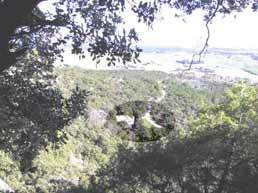 The property is situated on the south side of a mountain. The house is well exposed and enjoys a very beautiful view. 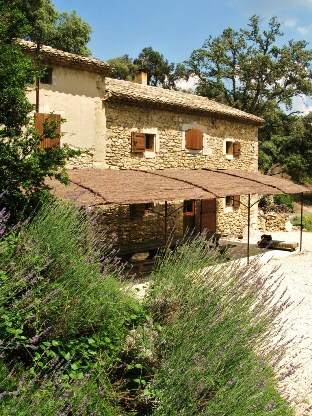 The house is protected from the Mistral (strong wind) by nearby cliffs. It is situated in the community of Bollène in the department of Vaucluse which is in the region of Provence-Alpes-Côte d'Azur. 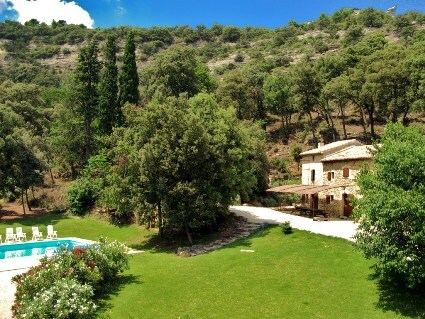 However, since you have to go through the village of Saint-Restiut, which is in the department of Drôme and the region of Rhône Alpes, the property has a postal address in Rhône Alpes. The access is easy from the highway A7 exit Bollène. Then follow the itinerary provided for 7 kilometres. In the interests of child safety, the swimming pool is equiped with an alarm which complies with all safety standards. All around the house, the tended terraces await the pétanques champions. Near the pool, there is a pool house which contains the pool filters, a washing machine, a fridge and a toilet. The watering sprinklers are automatic. A pergola has been placed on the wall at the front of the house near the kitchen. It has been installed to take advantage of the shade. This is the ideal place to drink an aperitif, to eat delicious meals, or to relax with friends. The thatch that covers it lets the air through while avoiding the full force of the sun's rays. The large table allows a gathering of more people than the house can welcome. Behind the house, a badminton net allows badminton enthusiasts to sportily let off steam. Raquets and shuttlecocks are available. 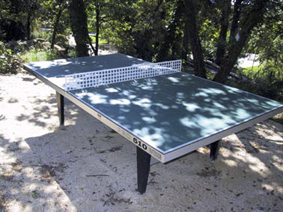 A bit further, a ping-pong table is ready for old and young alike. Raquets and balls are available. 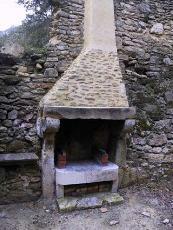 Next to the house, a consolidated ruin shelters a barbecue corner. The outside lighting lets you prolong the evenings. 32 acres of oak and evergreen oak planted in large ledges of a magestic circus of rocks and cliffs and dominated by the ruins of the Château de Chabrière give the property a particularly calm ambiance where it gives off a grand serenity. The little pedestrian paths, that wind in every direction, permit one to discover an exceptional view over the distant countryside of Bollène and the surroundings, the dentelles de Montmirail and the Mont Ventoux. 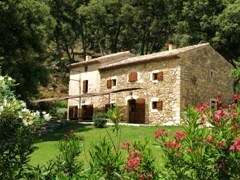 In the front of the house, a grass garden lined with laurel roses, lavender, santolines and rosemary is lined with a little wood of oak trees which make inviting shaded areas; they are at the disposition of those who search for calm or those who wish to leave the children splashing in the swimming pool.